Honey by Maxwell of McLaren Vale. . The Maxwell family's Meads have been acclaimed by leading wine critics and industry press for many decades. Opulent hues of 24 carat gold, a complex array of nine secret herbs and spices, decadently sweet with complex spice and the indulgence of aged brandy notes on the moreish finish. There has always been a love of wine and the vine in the Maxwell lineage. William James Maxwell a noted Scottish sculptor, came to Australia in 1875 to do some artistic work on a building in Melbourne. However, the cold damp climate of this city played on his health, so he moved three years later to the much more temperate climate of Adelaide, South Australia. A few miles south of the city at Edwardstown, he built a mock castle called Woodlands Park, and with the vines on the property made some very acceptable reds that he accumulated in the cellars of his unique home. His son John, with the thought of farming in his mind, acquired a property in the rich valley of McLaren Vale, 40 kilometres south of Adelaide. Here he and his sons ran a mixed farm of fruit, dairy, and of course vines. His interest in winemaking also led to a period of employment with Hardys at the historic Tintara Winery in the heart of McLaren Vale. In 1970, Ken Maxwell started a small self-contained winery on the eastern edge of his property and named it Daringa Cellars. Here he and wife Margaret made and sold very high quality red and white wine. In addition, they began to sell an ancient drink Mead made from fermented honey. In 1979, Ken sold Daringa to the Dennis family and with Margaret and son Mark started a new venture, an 80 tonne winery called appropriately, Maxwell Wines. 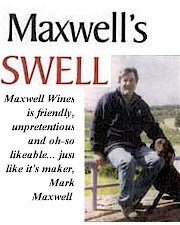 As the popularity of Maxwell Wines and Meads grew through the 1990s, Mark Maxwell realised that more space was needed. He then undertook the mammoth task of relocating the family winery to a site amongst vineyards he had owned since the early 1980s. Situated in the original heart of McLaren Vale just north of the main street on gently rolling hills, this was the perfect place for a new winery to be built into the south-facing limestone hill overlooking the township. Spanning three main levels, the winery was designed to take advantage of gravity flow throughout the winemaking process, contributing to the outstanding quality of the wines. Constructed from limestone and old solid timber, the design also allows visitors the opportunity to view a working winery while sampling the wines and taking in the magnificent views from the cellar door. Importantly, a special barrel cellar was also designed into the new winery. Hidden away at one end of the winery, the cellar was cut into solid limestone. With a natural earthen floor and impressive limestone walls, the cellar creates an ideal environment of constant temperature and humidity providing a perfect place to mature some of Maxwell’s best wines in barrel. 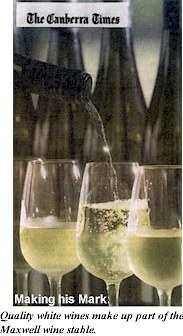 Mark also expanded the range of wines to include a Verdelho and, as it came into bearing, some Viognier. Outside of the busy vintage time, the Maxwell Mead continued to be made, with the family now recognised as the most significant (and largest) producer of this rare beverage in the southern hemisphere. Hence the winery actually has the dual function of being a meadery as well! The Maxwell Estate vineyards are some of the most favourably positioned in the McLaren Vale district. They are positioned on the southern slope and crest of Lumb’s Hill, amongst gently rolling hills just one mile north of the McLaren Vale township’s Main Street. Situated on solid limestone and in such proximity to the moderating effects of the Gulf of St Vincent, the conditions in the vineyards are ideal and somewhat blessed for producing small quantities of intensely flavoured grapes. One notable vineyard on the estate sits above and behind the winery atop the crest of Lumb’s Hill identified as a planting of the Reynella Selection Cabernet, it originates from vines brought into South Australia by noted wine industry pioneer John Reynell over 150 years ago. Back in the mid-1800s, John Reynell was planting some of the earliest vineyards in South Australia north of McLaren Vale. Having collected vine cuttings in South Africa on his way from England, he found that particular vines on his property kept producing noticeably more flavoursome berries.